Happy Fall lovely ones! Autumn is by far my favorite season for multiple reasons - October, crisp air, Halloween, pumpkin spice lattes... I designed this spread to Celebrate the Awesome that is Autumn with just a few of them! Thinking of bringing your tarot cards to the bonfire? Divining for answers while munching some scrumptious pumpkin pie? This is the perfect spread to try. If you try this spread and love how it works for you, be sure to post it on Instagram! Just use the hashtag #autumnalawesomness so we can share in the Awesome that is Autumn together! *Feel free to use tarot and/or oracle cards with this spread. I used the Psychic Tarot for the Heart oracle deck (Hay House Publishing) for my own reading. Check out my personal reading below to see how this spread can work for you. Give it a go with some of your fave oracle decks! - What needs to Fall away? What do you need to crunch underfoot? I am currently in the process of releasing lots of things from the past and the present. As I release these things, I need to truly let them go and not keep thinking about them. This feels like I need to just keep moving forward and not look behind me. - Where will things be heating up for you this Autumn? Yay! Looks like some new opportunities may be coming up this Fall! This feels like a reminder to keep fueling my fire and passion. Doors will be opening on the other side of the release. I can't walk through them if I'm looking back at what I've already let go of. - Where is the sweetness? I have been definitely learning how to choose my battles wisely lately! It is just not worth the time or energy to feed into another's negativity. This resonates with me as a message of protection as the Wheel of the Year turns yet again. It is also a reminder to not let ego control my words or actions when my pride may be hurt. - Where are you afraid? What are you hiding from?
. Yes, Universe, I know this is something that always comes up for me. This is definitely a fear of mine and one I have been working through for many years. I guess this Autumn will be no different lol. Progress has been made, but there is always work to do. - Where can you bring more comfort to yourself? I love this card! It totally feels like sitting in quiet meditation, chatting with my spirit guides, and conversing with the birds. Feeling Mother Nature's energy and seeking peace inside of it! This Fall may be a time of learning and seeking out new information. - Where should you be more thankful? How can you focus more on gratitude? I need to embrace situations for what they are - both the good and the bad. To honor the balance in all things. This is a reminder to embrace others and love them as I wish to be embraced and loved. To connect with the collective and the collective unconscious. This also encourages me to send healing to others/the world as a show of gratitude for the blessings I have in my life. 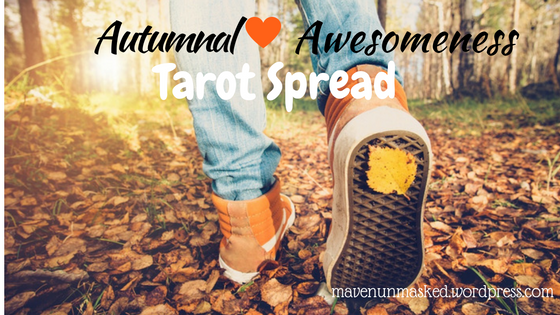 Tagged: autumn, autumn tarot, autumnal awesomeness, autumnal equinox, divination, fall, fall favorites, fall tarot, gratitude, halloween, pumpkin spice, Tarot, Tarot Spreads!